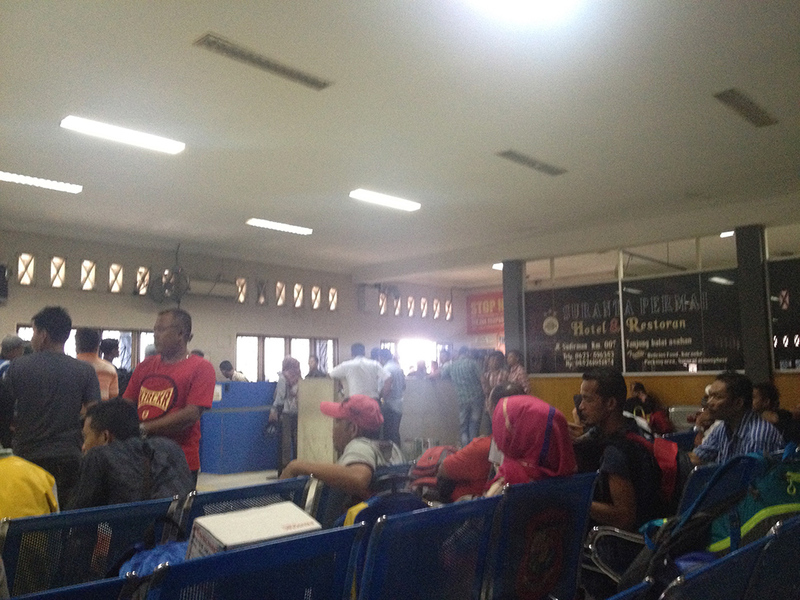 The main reason I tookf the ferry to Tanjung Balai and not Dumai where I would have been able to get a visa on arrival, is because I wanted to avoid the 15 hours bus ride from Dumai to lake Toba at any cost - or almost, and from Tanjung Balai Asahan it is just a 5 hours bus ride. When you get to the embassy, get a number at the reception and head upstairs to wait. 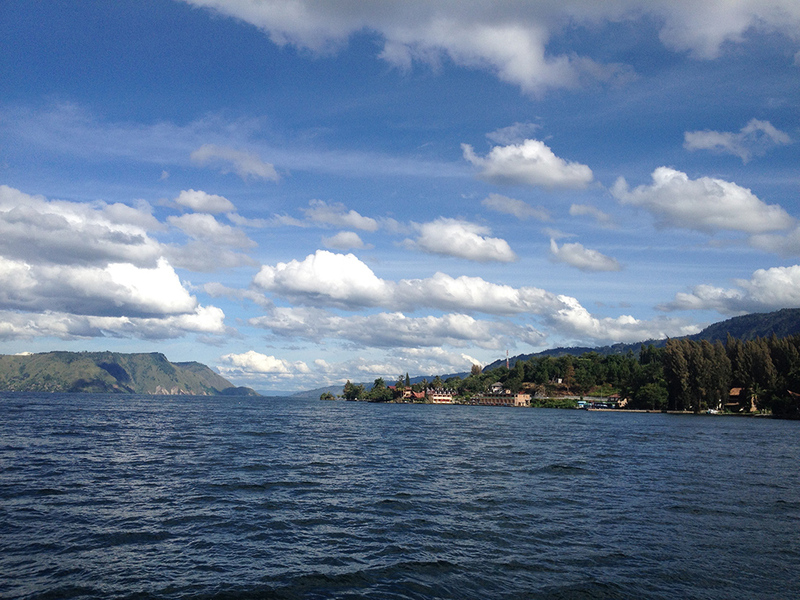 Being able to get a visa on arrival, the lady was intrigued why I wanted to go to Tanjung Balai, so I told her I then wanted to go to Lake Toba and did not want to do the 15 hours bus ride, to which she replied that I could fly to Medan, to which I replied that I did not want to take the plane. Anyway, after checking all the documents were there, she gave me a receipt and told me to come back the following day from 2pm. The next day I just went straight upstairs and gave the receipt, and 5 minutes later I was out of the embassy. 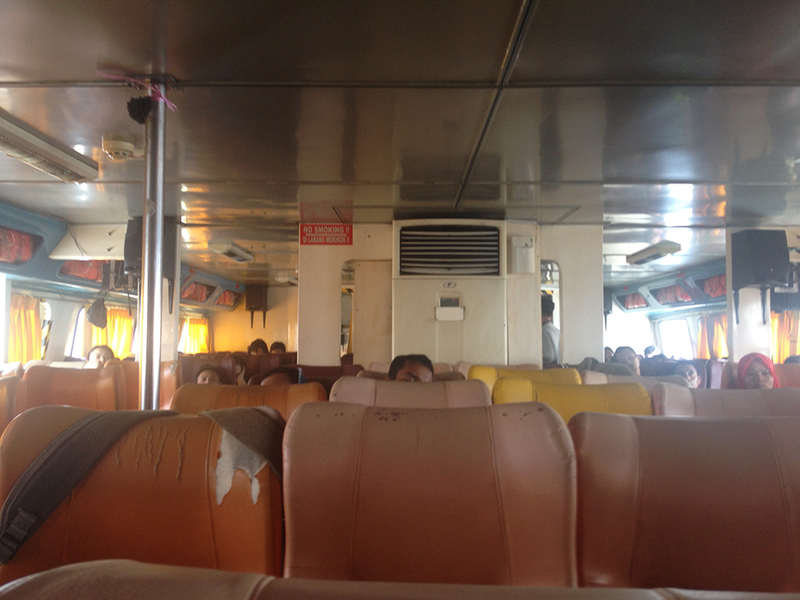 In Kuala Lumpur, wether you want to go to Dumai or Tanjung Balai Asahan, the ferry leaves from Port Klang. 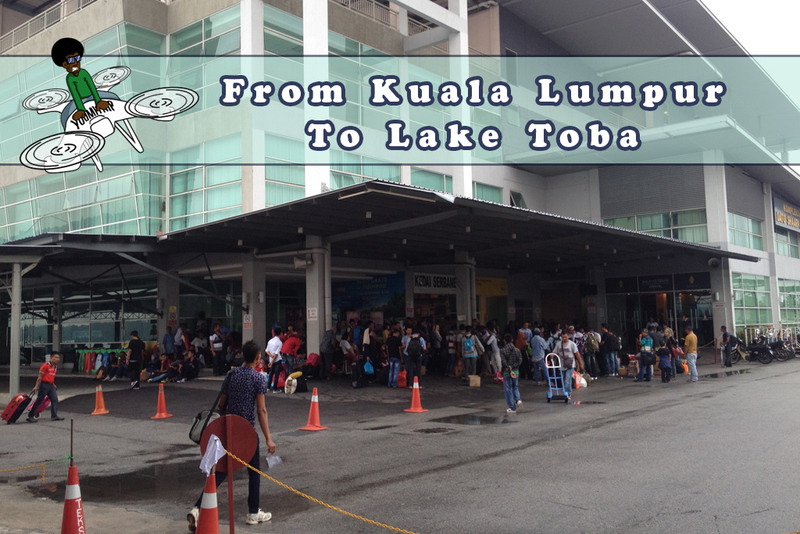 You can get there by Komuter - KTM - from KL Sentral. It will take about 1h30m. The ferry terminal is just accross the street. I got there around 9am for a ferry departure at 11am. When I first arrived at the terminal it was quiet confusing and did not really know where to go; there was a lot of people waiting at front, but after asking, someone told me to go upstairs by the stairs hidden in the corner behind the crowd to get my ticket. So I got upstairs, and started to queue. The company running the ferry is called Aerospeed. 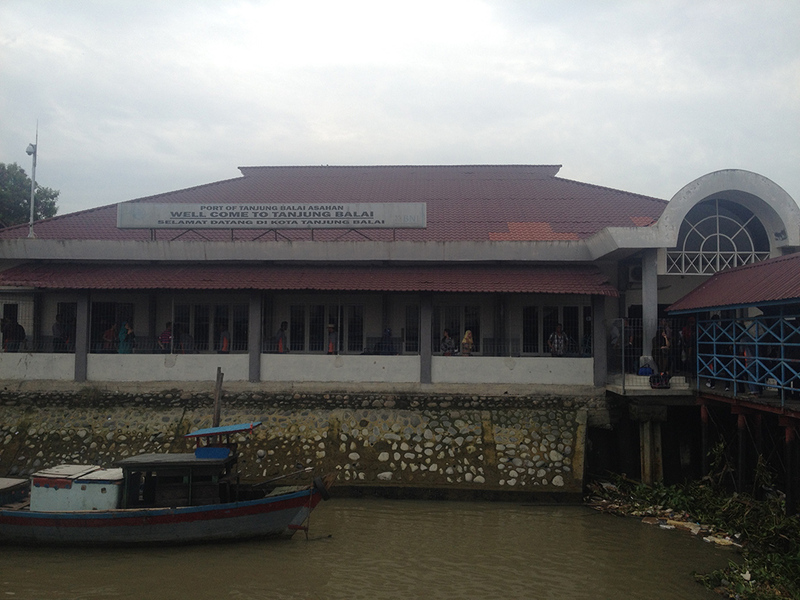 From this wikipedia page (link) you can read that there is several companies running ferries to Tanjung Balai, but there was only 1 counter opened. When it was almost my time to ask for a ticket I took out my wallet to take the money... and to my surprise I did not have enough! Wait, what?! I went to the ATM this morning specifically to get money for the ferry... Ooooh, I see what I did there; I withdrew the money, but did not actually take it. Genius! So I had to go out and look for an ATM. I asked a few people and they told me I had to walk back towards the city. Luckily there was a bank about 800m from the terminal and I was able to withdraw some money and take it with me this time. Back at the ticket office to queue for another 20-30 minutes. I finally got my ticket after they checked that I had a visa in my passport. It cost me RMB 115 + RMB 20 (port fees). Then I headed back downstairs and gave my passport to the person at the departure gate. He told me that I needed a red borading pass. What?! I was at the ticket office and she only gave me this ticket. back up again to ask about this red boarding pass. It turned out the woman just forgot to give it to me with my ticket. No big deal. By the time I was back at the gate, the person had changed and this one told me I had to "chek-in" one of my backpacks at the front of the terminal since there is a one-bag per person policy. Raaaaaaaaaaah!!!! It cost me you RMB 20 for a big backpack. 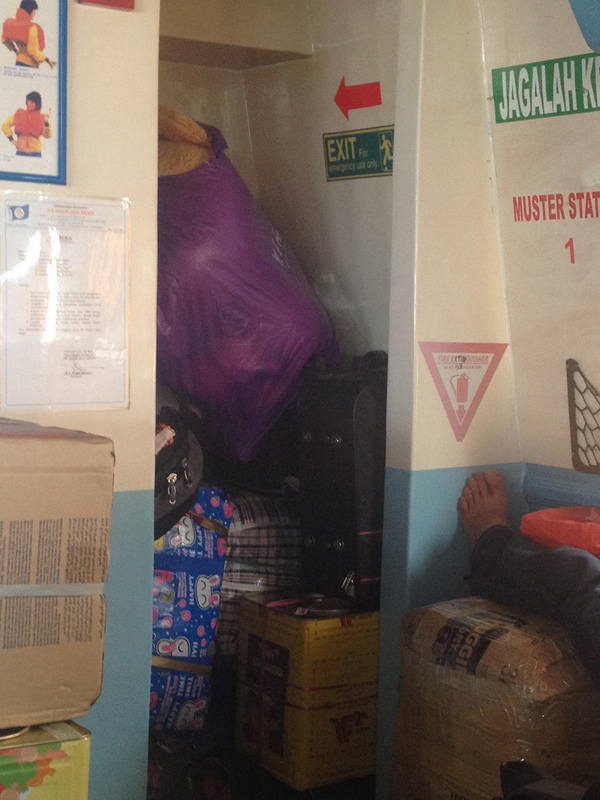 After immigration clearance, I was finally on the ferry waiting to depart. Although it is not too rough it's not peaceful either. They played this loud karaoke music was playing the whole time. I know it was karaoke because at the front there was a TV where the lyrics were displayed, karaoke style. 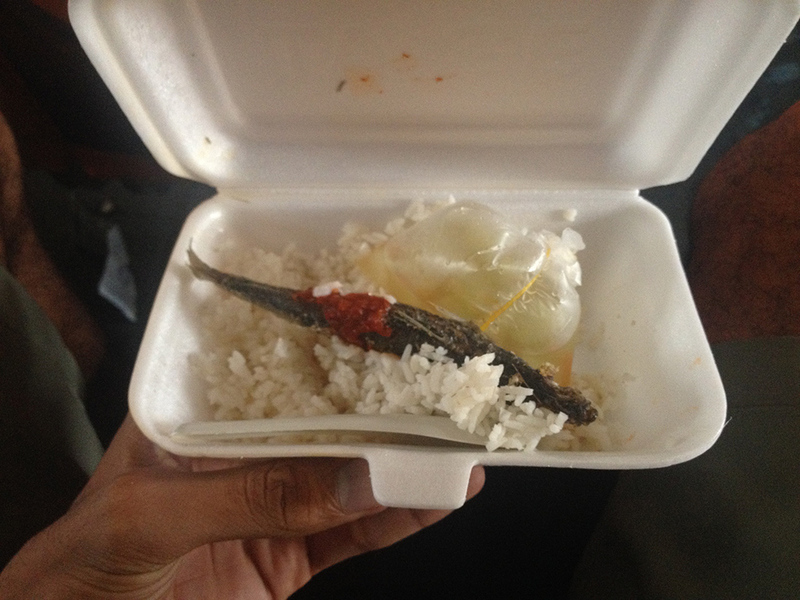 They do give you a "lunch" which consists of rice and a small fish. Not really mouth watering. Knowing my ability to handle boat rides, I decided to save it for later. I managed to get some sleep which helped me not getting sick on the boat. Although you will see the sign at the ferry terminal promoting the cruise to be about 4 hours, it took the boat more than 5 to cross. I was the only tourist - not counting the Malaysians - in the whole crowd so the officials spotted me from far. One of them just asked my the purpose of my visit and then told me to go sit down. 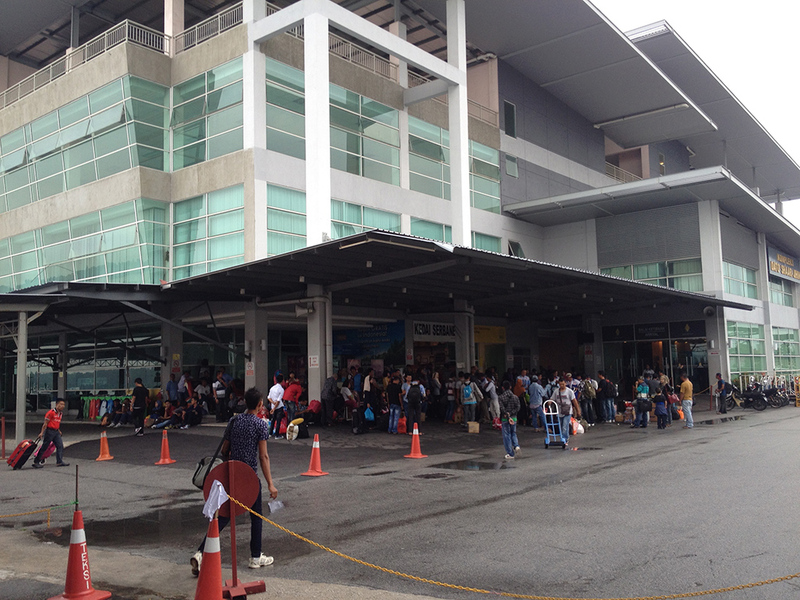 There was two queues of people waiting to get into Indonesia. 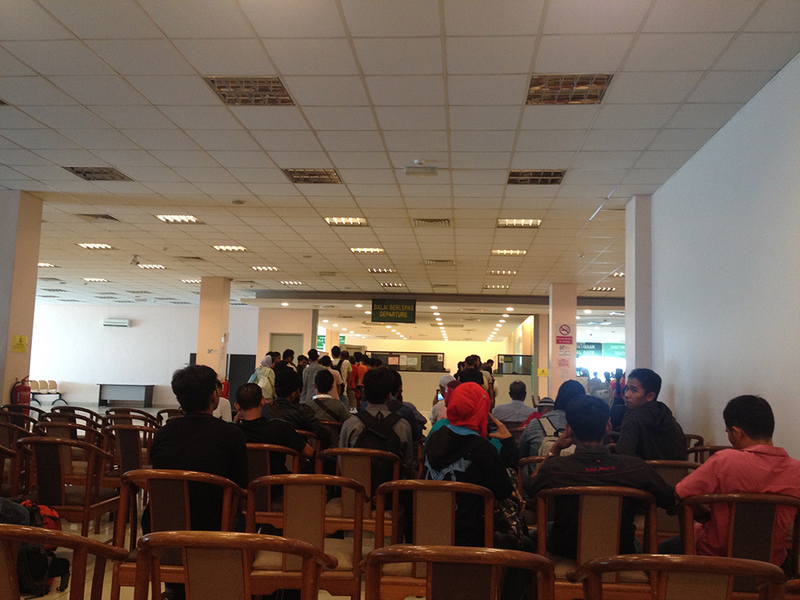 After a while, the same official came back and told to come with him and they "checked" me into Indonesia. I then went to take my backpack with the receipt I was given before. After that, every bag is screened and although I had a drone, they did not seem to bother. After a few more questions from the officials, I was out to look for a hotel. 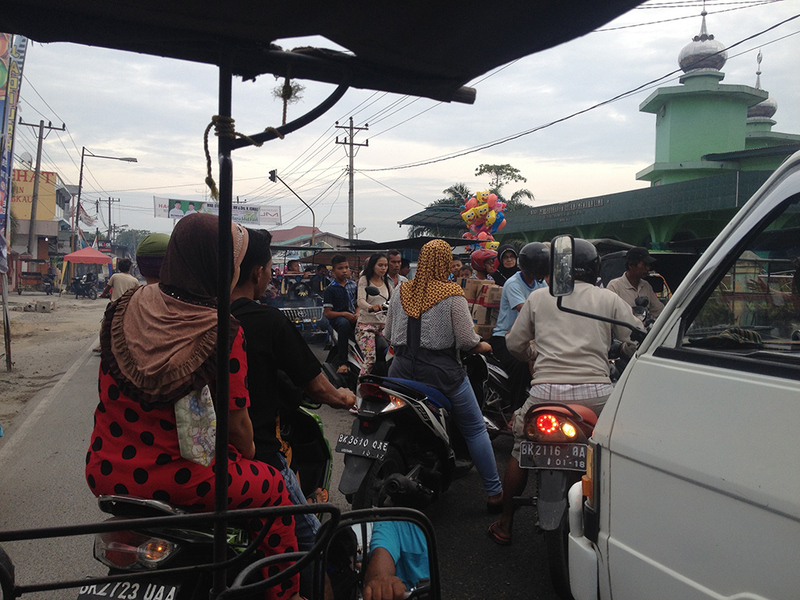 Being the only foreigner in the area - I'm pretty sure I was - a lot of people came to me to offer to drive me somewhere. An official came outside to my rescue and designated someone to drive after we negotiated a price. 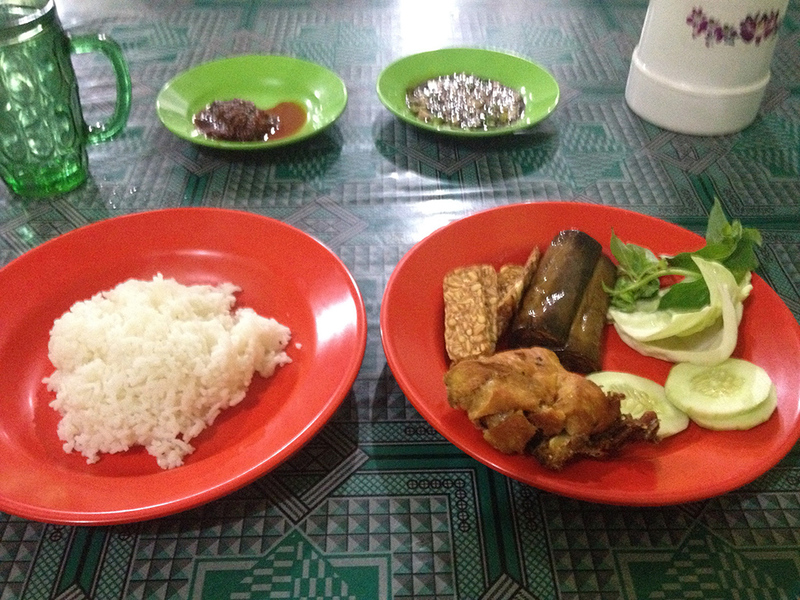 He drove me to Tresya Hotel, a bit outside Tanjung Balai for 35 000 Rp. The hotel was very conveniently located since it was right accross the street from a bus station. 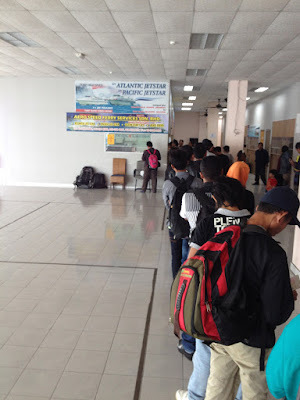 In the morning, around 10am, i just showed up and told the persons there that I wanted to go to Permatangsiantar. They directed me to a bus that was about to leave and I jumped in. The ride was not too bad and it took about 3 hours to get there. It cost me 30 000 Rp. 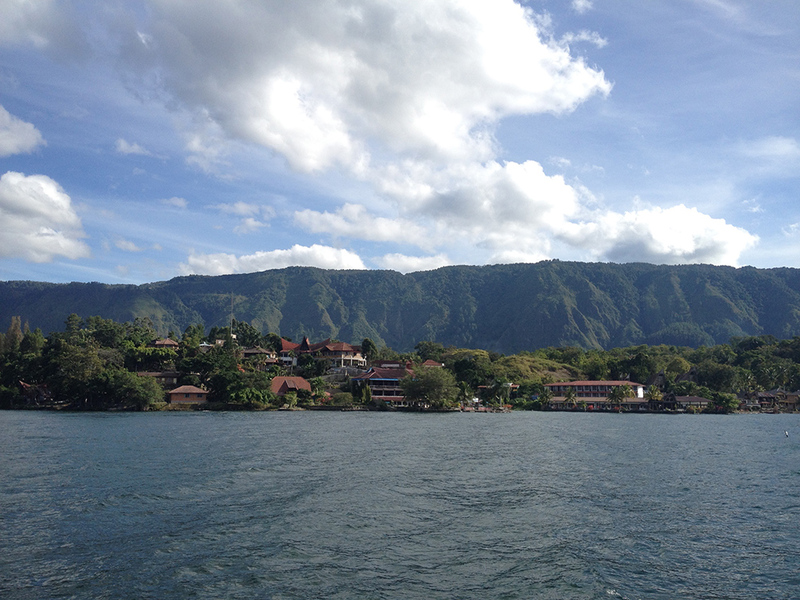 Then I took one of those shared taxi for 20 000 Rp to Parapat, where you can take the ferry to Samosir island on Lake Toba. The boat ride costs 15 000 Rp and takes about 45 minutes. Before boarding, i met a guy who introduced himself as Joshua. He owned a small restaurant / guesthouse on the island called Chili Bar where I stayed and had a great time.